SINGAPORE: Singapore and Malaysia moved to strengthen growing economic ties on Tuesday with plans to build a high-speed rail link by 2020 that will cut travel time between the wealthy city-state and Kuala Lumpur to 90 minutes. The neighboring Southeast Asian countries also said they would look for ways to intensify cooperation in developing the Iskandar Malaysia economic zone that's across a narrow strip of water from Singapore. "It will facilitate seamless travel between Kuala Lumpur and Singapore, enhance business linkages and bring the people of Malaysia and Singapore closer together," they said. "Ultimately, this project will give both countries greater stake in each other's prosperity and success," it added. 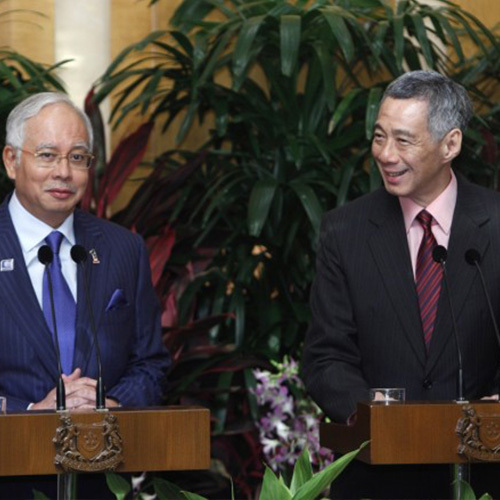 The high-speed train "is a strategic development that will dramatically improve the connectivity between Malaysia and Singapore,"
The two governments said in a joint statement. The rail agreement was a "major breakthrough," said Chua Hak Bin, Southeast Asian economist at Bank of America Merrill Lynch. But he noted the potential for bureaucratic delays when such mega-projects are undertaken. "It's technologically possible. We've seen how fast China builds these things," Chua said. "It makes a lot of sense. There is a huge amount of business, trade and investment between the countries. There are also a large number of Malaysians working in Singapore." A new customs, immigration and quarantine facilities at Puteri Harbour in Malaysia's Iskandar zone will likely be set up this year, the two governments said. The two leaders will also be at the unveiling of a project by Singapore's CapitaLand Ltd (CATL.SI) in Iskandar, the first in the zone by Southeast Asia's biggest developer.